Safety Rules Are the Best Tools! 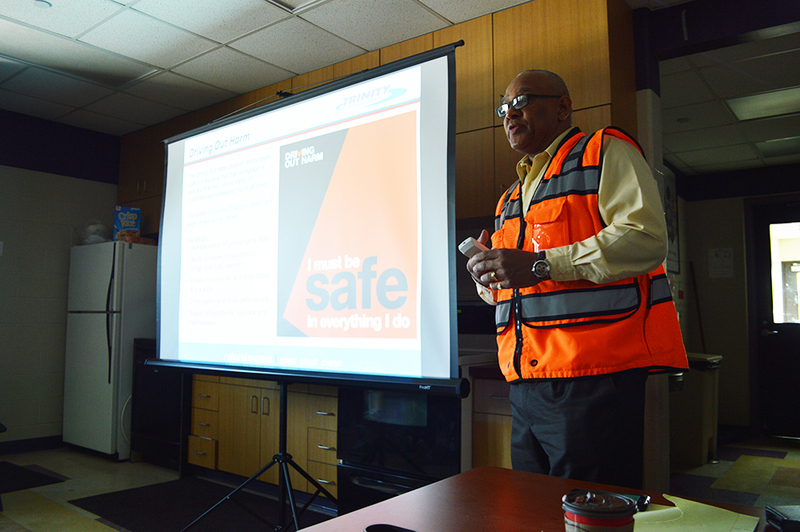 Our safety meetings for May were conducted the 21st through 26th and were packed with vital information for our drivers and aides! The meetings were executed by Dave Holls, chief operating officer, and Carl Ingram, Detroit area safety director. 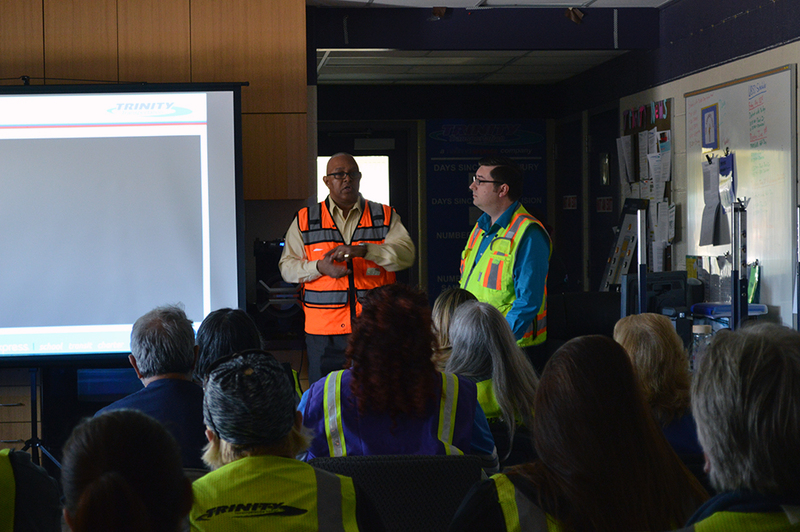 Our safety meetings always start with a little introduction then local news and updates from each terminal’s general manager and maintenance department. After the local updates, Dave talked about distracted driving and showed a news video regarding a recent school bus accident in New Jersey. This horrific accident was caused by a driver who was recklessly driving on the interstate, and is an instance of what could happen when someone is driving distracted. It is not worth the risk. This is why our parent company, National Express, implemented the Target Zero campaign in February. Target Zero is the next phase of our Driving out Harm program and was put in to effect to eliminate fatal accidents from our company. Target Zero is a call to action that encompasses all of our efforts to reduce distracted driving and make the roads safer for our communities. 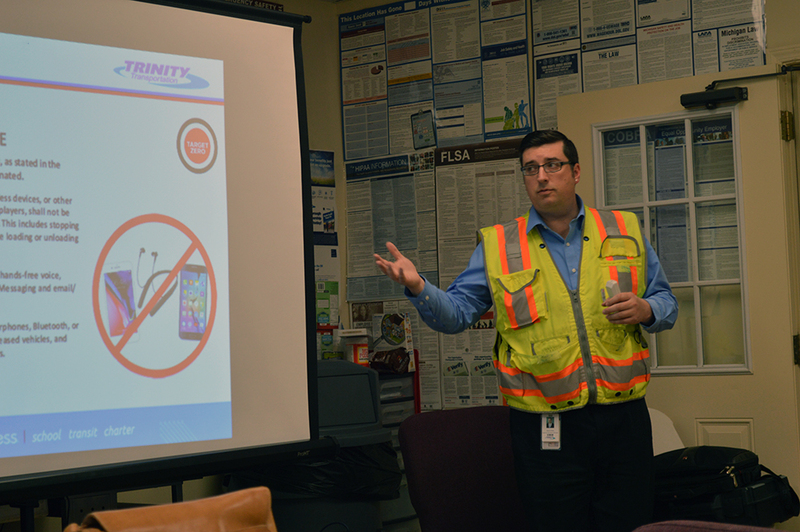 To piggy-back off of safe driving habits, Dave discussed performance feedback for the month of April. After Dave went over the numbers, Carl reviewed the Driving out Harm program and reiterated the Golden Rules for our drivers (they’re listed in this blog post). Carl then addressed our company’s safety performance KPIs (key performance indicators) for the month of April and talked about the heat risks of summer as the new season approaches. He covered the symptoms of heat exhaustion, heat stroke, hyperthermia, and dehydration and how to prevent them. Carl also mentioned how there will be more people on the roads since school will be out soon and discussed different ways drivers can be more alert to the extra bicyclists, pedestrians, cars, and motorcyclists. Summer is also the season of roadside inspections by Michigan State Police, so Carl covered the various responsibilities drivers have, including carrying their credentials at all times, completing thorough pre-trip and post-trip inspections, and being extra aware of their surroundings. To finish the presentation, Dave returned to remind drivers of our upcoming company activities. First is attendance bingo, where employees get a stamp for every date on their card for which they have perfect attendance during the month of May. Once an employee has a bingo, they turn in their card and have three chances to win awesome prizes, the ultimate grand prize being a 55” Smart LED TV with a Blu-Ray player and complete sound system! Second is our first annual Detroit Tigers company outing, which is taking place on June 2nd. If you’re at that game, keep a look out for a large group with purple shirts – that’s us! And lastly, Dave announced Trinity’s 22nd annual company picnic, where we have food, fun, and prizes! We’re excited for the fun things ahead and to continue with our safety mission!